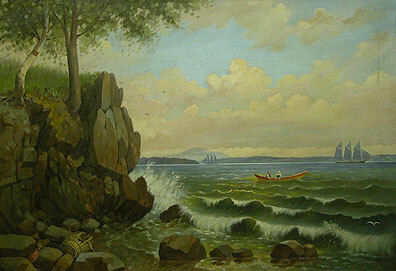 Seascapes are generally expressive and “painterly” with emphasis on light and shadow, form, proportion, and color. There may be no vessels portrayed at all, and if vessels are included they are usually generic and anonymous, similar to stage props. 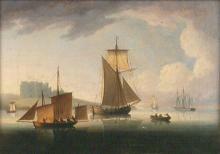 A typical seascape might feature a headland, a dark sea, thunder clouds and a lone sailing vessel. 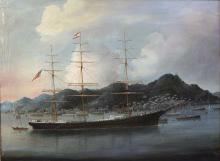 A sailing vessel with a single fore-and-aft rigged mast., an early steam vessel with auxiliary sails, and an open French or British boat. It looks as if it could have been painted in the mid-1700s, but was actually done in 1820. A privately-owned vessel armed with guns which operated in time of war against the enemy's merchant ships. 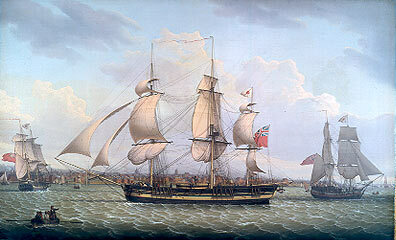 Privateers were commissioned by letters of marque, which licensed them to take prizes. Privateering was abolished by the Declaration of Paris in 1856.. The process of creating a product or artwork without a commission or contract, then trying to sell it.. 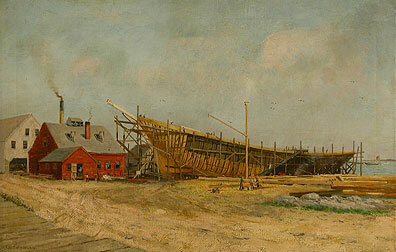 Some paintings show work on or alongside the water, such as a shipyard or fishing scene. Naval scenes show battles or naval vessels. They may commemorate a great victory or merely show a captain’s favorite ship. To begin a voyage. This term is used for mechanically-powered vessels as well as for sailing vessels. To set the sails on a vessel is to raise, open, and extend them to the wind. as they leave. 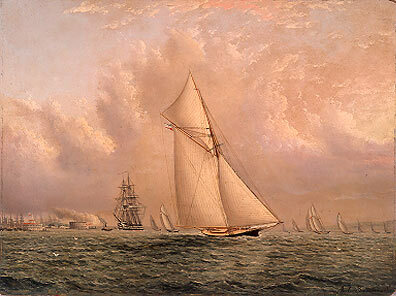 The artists, whose clients were captains and ship owners who wanted accurate paintings, studied their subjects closely. Many had been to sea, and, of course, they traveled by water on ships like the ones they painted. None made much money. In the 1850s James Buttersworth sold his paintings for $20 - $50. To support his family of four he needed to sell about 25 works a year. 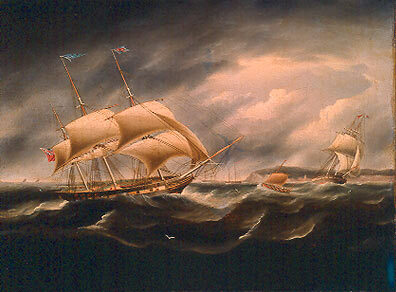 Ship portraitists painted to live; they did not live to paint. A straight piece of timber or a hollow cylinder of wood or metal set up vertically or nearly so and supporting yards, booms, derricks, or gaffs. Read More; the quality of the picture is determined by the accuracy of these details. Like photography in later years, ship portraits were documentary. Slang expression for the ship portrait painters that were found in many major ports in the 19th century. had a background scene already painted, ready to add the vessel in the foreground. Look closely at this painting. You can see the reflections of four masts on the water, but the vessel has only three. 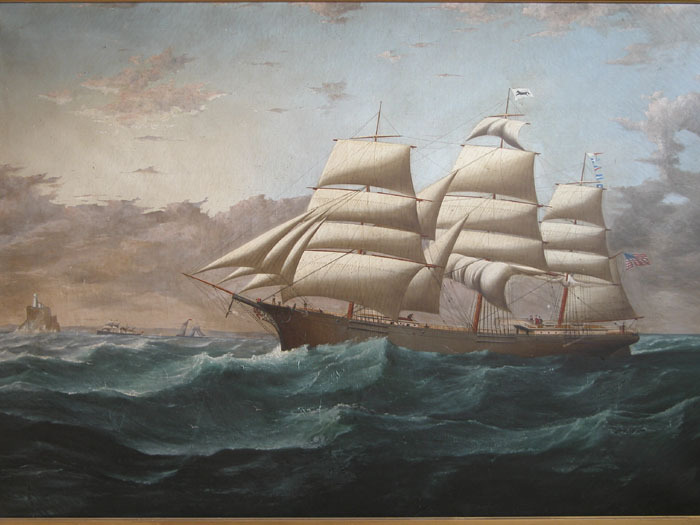 The story goes that the unknown Chinese artist who painted the picture placed one mast in the wrong position and the captain made him paint it out and move it. The artist neglected to remove its reflection. 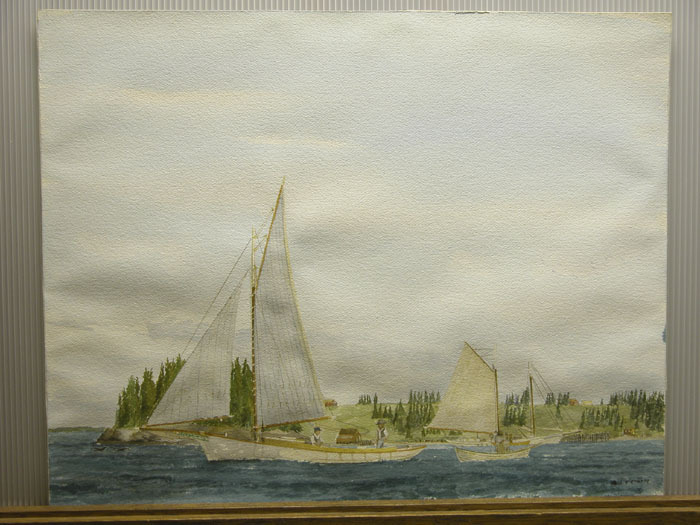 Compare this painting of the Manuel Llaguno with a needlework representation of the same vessel made by a retired mariner, shown later in this unit. A ship portrait is to a vessel what a portrait is to a person: a likeness of a specific subject. The best have well-painted foreground seas and background skies (below left). 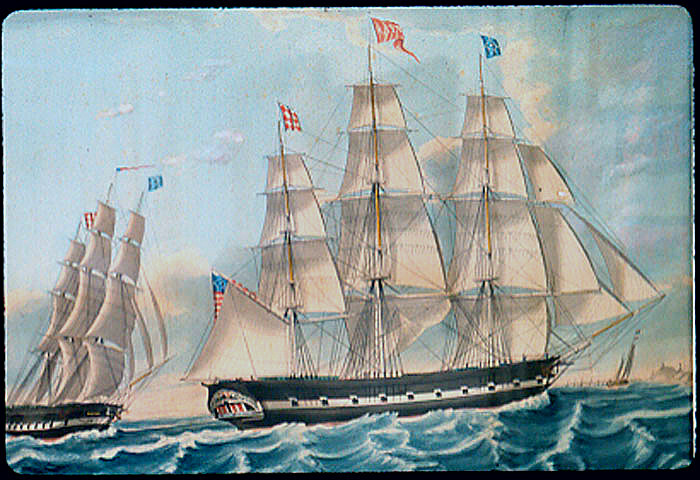 One technique of ship portraiture, as it developed, was to show the vessel in two or three views in the same painting—the painting below to the right shows two starboard views.